What is it important for me to be teaching now (focusing inquiry)? What strategies are most likely to help my students learn this (teaching inquiry)? What worked, and for whom, and what are the implications for my teaching (learning inquiry)? 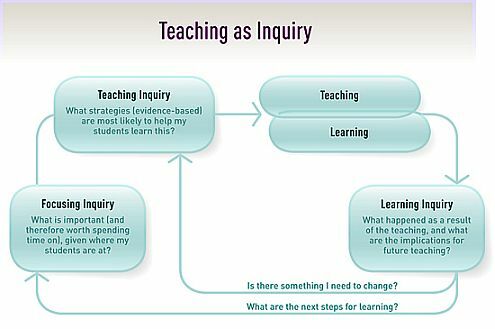 Teaching as inquiry diagram from NZC. The first question requires us to know our students; the second, to have (or acquire) the appropriate content knowledge and pedagogical content knowledge; the third, to assess what learning has gone on and in whose mind. The answer to this third question will have implications for our teaching – and possibly, our own learning. We may find we need to look for different strategies or even a completely different approach. The curriculum offers a brief summary of pedagogical approaches that are applicable to all teaching. For a more comprehensive guide, with a specific focus on the social sciences, see Effective Pedagogy in Social Sciences/Tikanga ā Iwi Best Evidence Synthesis Iteration [BES]. This synthesis identifies four ‘mechanisms’ that are at the heart of effective social sciences teaching and learning. Education for sustainability places strong emphasis on supporting students to develop action competence. This emphasis is strongly embedded in the learning objectives and requires teachers to adopt a holistic approach to teaching and learning.